Moroccan-style tamales? Yes, please! And no, you won't have to buy any special spices (as long as you have cumin, turmeric and ground coriander on hand). Soak corn husks in hot water 30 minutes or let stand overnight in room-temperature water. Prepare Tamale Dough recipe, adding the cumin, turmeric and coriander with the flour. Assemble tamales by spreading 2 Tbsp. of the masa mixture (tamale dough) into a 3x2-inch rectangle down the center of each corn husk, leaving about 2 inches bare at the top of the husk. Spoon 1 Tbsp. of the chicken over the masa in each husk. Combine dressing and cilantro; spoon 1 tsp. of the dressing mixture down the center of the masa mixture in each husk; fold over the sides of the husk and both ends to completely enclose the filling. Stand tamales in a steamer basket in large pot filled 1/4 full with water. (Make sure tamales are not touching the water.) Bring water to boil; cover. Steam 1 hour or until tamales pull away from the corn husks, adding more water to the pot when necessary. Remove tamales from steamer basket; cool slightly. Top with BREAKSTONE'S or KNUDSEN Sour Cream just before serving, if desired. Spend time with your family making this special recipe. Then when it comes time to enjoy these treats, be sure to keep an eye on serving size. 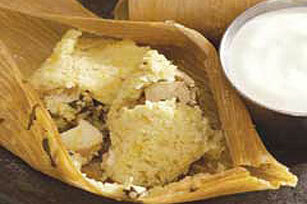 Tamales can be filled with chopped leftover cooked pork, beef or beans.